Assembling a softbox in under 5 seconds? 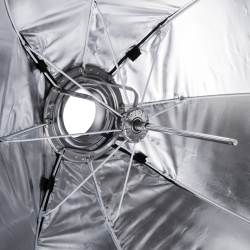 Our new Octagon Umbrella Softbox Ø 90cm is mounted as quickly as an umbrella due to its genius umbrella technology: unpack it – open it – you’re done. At the same time, it is very sturdy, which is why the Softbox is particularly well-suited for outdoor and on-location use. 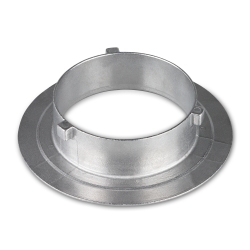 It is the ideal helper for soft and even lighting. 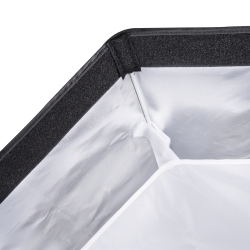 Whether it is portrait, group or comprehensive product photography – whenever reflection-free lighting matters, this Softbox is the right equipment. 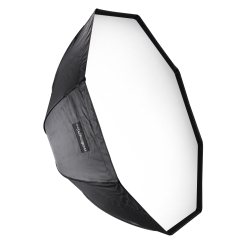 Due to the nearly round shape, the Softbox is particularly well-suited for portrait and people photography as it creates a round reflex in the eye.